How Can I Stop My Dog Begging? Help! How Do I Stop My Dog Stealing Food? A common problem, dog begging. Or is it? A problem, that is? A begging dog is cute, no? A dog who begs for their supper, tidbits or 'a bit of what you're having' is all part of the canine charm, is it not? Ultimately, that's entirely up to you. You see, the begging 'problem' is only a problem when it becomes a problem. If you follow me. Dogs who learn to beg for food often fall in to that horrible grey area of learning a behaviour/habit that is, as far as their owners go, OK sometimes and totally not cool at others. Hmmm. This is no good. Not really. Dogs are far happier if they understand that a behaviour is either OK, all of the time, or not OK, all of the time. Begging is one of these behaviours. Learning to beg or steal food is the easiest of all life's lessons for a puppy. The art is most often taught by the pup's owners. In some cases, it is learned when food is accidentally dropped on the floor, or left unattended where the puppy can get at it. Human taste discrimination is so crude when compared to the dog's that many owners fail to appreciate the mistake of giving their pups little treats of the family food fare. Many times it only takes one taste of highly spiced table food to ruin a puppy's appreciation for its less-seasoned commercial diet. The result can be a pup that turns up its nose at dog food and becomes a roaring menace around the dinner table. The training method of extinguishing begging takes time. The time it takes depends on the duration of the habit, the pup's tenacity, and the consistency of its owners in carrying out corrective procedures. It requires that absolutely no attention be given the begging pup, regardless of its antics in trying to gain tidbits. In the case of food stealing, the training method of extinguishing the behaviour requires even more careful control of the environment, especially when young children are involved. 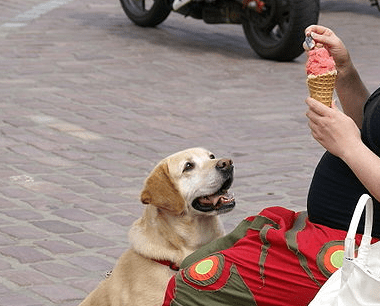 They usually love to share their goodies with their pets, but it is impractical to explain the cause-effect relationship to such youngsters when they complain that "Sparky jumped up and stole my ice cream cone!" Children also tend to leave articles of food around on low tables and chairs, an irresistible temptation for most puppies. To eliminate stealing, whether it is overt (taking food from children) or covert (pilfering the thawing dinner steak), it is necessary to initiate a program of at least 4 weeks, during which no food is ever placed within the pup's reach. It goes without saying that no tidbits should be given during this period. Remedies that often fail include lacing some food with pepper or ammonia, saying "No-no" while tempting the pup, and physically punishing the animal when it approaches the family's food. These fail because they require the presence of some agent other than the food, either the aversive-tasting element or the owner. When these elements are not present, the pup is rarely discouraged from stealing the food. It learns to discriminate between treated and untreated morsels, and to avoid food in the owner's presence. Begging food from the dinner table is one of the easiest things to teach a dog, and also one of the hardest habits to break. Your pet's training to beg begins when he is a young, adorable puppy. It does not take too many repetitions before he learns that he gets fed from the table by begging. Then he sits by your chair while you are eating and stares at you. Occasionally he'll get up on his hind legs and paw you, or he'll nudge your arm and remind you that he is waiting. And he drools, that's the worst part. He looks as though you never feed him. If you don't have this problem, prevention is quite simple. Don't start giving your dog food from the table. If you must give your dog table scraps, give them in moderation and in his own dish after you have finished eating or, better yet, with his regular meal. Once you have a dog that begs, it becomes a self-perpetuating problem. Begging is rewarded with food. Chances are, if you have this problem, you've tried to stop his begging, you've yelled at him when he begs, pushed him away, and even gotten really angry, but he just gets more persistent. So you've had to give him something to be able to eat in peace. What you have done is to reward his persistence. Each time you have tried holding out longer, but have ultimately given in, you have further trained him that no matter how far away the rainbow looks, there is a pot of gold at the end if he simply waits. When you are tired of this behaviour and want to end it, when you get to the point that you can't stand the drooling, the whining, the pawing and the sad eyes staring at you, then you have to steel yourself for the cure. Using the positive approach, give him the command "Down” and have him do a long “Down” by your chair during dinner. Be prepared for many interruptions initially, while you reinforce his “Down.” Each time he gets up, repeat the command and replace it if necessary so that he remains down during your dinner. With a truly persistent begger, your first week of dinners may be quite a trial. Some dogs bark repeatedly and go through all manner of random actions to try to get you to feed them from the table. But once you have begun the training, stick with it. If you give in at any time, no matter how small the tidbit you sneak him, not only have you lost that battle, you may very well have lost the entire war. If you have made up your mind that you don't want begging, then it's just a matter of time before you have your dog resigned to the fact that the party is over, at least at the dinner table. When your dog is steady enough to do the long “Down” away from your side during dinner, then establish his place where he stays while you eat. He should be put in his place every evening while you are eating, and praised when you release him at the end of the meal. It won't be too long before you will be eating dinner in the company of a well-trained, well- behaved dog lying quietly in the corner. Unless they are trained not to do so, most dogs will form the natural habit of begging for both attention and food. Some dog owners except this behaviour and think it's cute, but most people get annoyed very quickly when their dog starts to beg every time he wants love, attention, and especially when he smells something tasty cooking in the house. What is wrong with begging you might ask? For starters, begging is another form of demanding and it gives your dog an aspect of control within the family "pack". I describe your family as a pack because that is exactly how your dog sees it. Anyways, while it seems adorable when Sparky rolls over on his back expecting a belly rub every time you enter the room, or just sits all teary-eyed staring straight at your plate of food when you're eating dinner, this behaviour has the possibility to gain momentum and become aggressive. Just how aggressive can a dog possibly become? If you do not think that your dog could ever possibly bite your hand because he expects you to give him food every time he begs, think again. For years a friend of mine would hand feed his puppy pieces of food at any time of the day he was eating. If it were breakfast, his dog would get a two pieces of bacon. At lunch time my friend would hand feed his dog a few bites of his sandwich. The same went for dinner. After some time, his dog matured and grew bigger, and my friend did not realize that he was reinforcing a dominant leadership role into his dog every time he gave in to begging. Once he decided to change this behaviour with his dog, he learned quickly just how dangerous the situation was. At one of his meals, my friend absolutely refused to feed his dog anything and the begging and crying turned into aggression and barking. Then without notice, his dog leaped up onto his plate and snapped at the food, taking a little bit of my friends flesh with it. The above example may seem a bit extreme and you still probably could never imagine you're adorable dog biting you in the attempt to get food that he was expecting. However, the problem is real and you must start early in your puppy's life with instilling the rules when it comes to begging. During your meals, you need to train your dog to sit and stay in a specific area when the family is eating. This may take some time but eventually he will remain in a sit position until after your dinner is over and then of course you should praise his actions by offering him up a nice hot meal that he can eat in his own food bowl, and only after everybody else is finished eating. In order to achieve polite puppy dinner behaviour, you first have to define it. For example, I consider it polite in my household if my four dogs lie quietly at our feet while we eat. If they don't beg, bark, whine or otherwise nudge us for treats, they get an occasional treat from our dinner. You may, on the other hand, prefer to teach Sparky to lie on a dog bed on the other side of the room during meals. A tether's your ideal management tool for this. Help your puppy acclimatize to being on the tether outside of mealtime so you won't have to constantly interrupt your meals to train. This shouldn't take more than one or two practice sessions. Meanwhile, use a crate or baby gate to confine your pup so you can have relaxed, puppy-free meals. When Sparky has learned to accept tethering, set up his tether in the dining room away from the table, a distance that's comfortable for you and at least far enough so the dog won't be tripped over as the family moves around the table. Prepare a treat-dispensing toy or other interactive toy to keep him happy while you eat. Occasionally, when your pup is relaxed and quiet, calmly praise him, and walk over to feed him a treat. In short order you can fade out the treats and Sparky will be content to share meals with you at a respectable distance. Eventually, the polite dinner habit will be so well-ingrained, you won't even need the tether. It's normal for puppies to pick up everything with their mouths – that's how they explore the world. You can make life easier for you and your pup if you do a good job of management – basically, keep non-chew objects out of your pup's reach. Inevitably, however, Sparky will find a forbidden object, such as a book or a shoe; something of value to you; or something that might harm him. To teach give, offer Sparky a toy that he likes to play with. When he's happily playing, offer him a treat. As he drops the toy to take the treat, say “give” and feed him the treat. Then toss the toy for him to play with again. What a cool game – Sparky gets the yummy treat and he gets to chase the toy again! After a few repetitions, start saying “give” first, then offer the treat in trade for the toy. With practice, he'll learn to drop the toy on the give cue, and you can treat randomly – but sometimes, not always, eventually stopping the treats altogether with just using praise. The more you spoil your dog, the more you enable bad behaviour such as begging. Instead, make treats part of a reward system. When your dog has been good, give them a treat as a reward. Eventually, teach the dog that a short, sharp play session is 'the treat' and working for positive reinforcement doesn't have to be centred around food. To train your dog to stop begging for human food, you should completely ignore him when you are eating. If you pay attention to him, he will think he has a chance of getting your food, and therefore he will never stop begging. If you ignore him during your mealtime, he will soon learn that begging is pointless and stop. Be mindful of exactly what behaviour you are reinforcing, so stand your ground and don't give into your pet's persistence. A dog will generally repeat whatever action has previously earned it a reward. Thus, if you give a dog food so that it will stop begging at the table one night, you're only making the dog more inclined to beg for food again the next night. If you are trying to prevent your dog from begging, the best thing to do is ignore the begging completely. Don't respond either positively, with a treat or petting, or negatively, by shouting. Your dog will learn quickly and remember for a long time that the begging ended up with you paying attention to the dog. hi, my moms dog is always begging, it gets up on the sofa when told NO!! it begs for food, jumps up on the work surface and in general is a beg. How can i help to stop this because she is ruining the sofa and its not hygenic for a dog to be where the food is in the kitchen, thanks. If you are sayoing ‘no’ to the dog you are giving it attention ( albeit negative attention) for performing the task. Without looking or speaking, take the dog by the collar and remove it (if it may bite you attatch a lead/leash until this behaviour has stopped and remove with the lead) and repeat this exercise. If you remove the dog a few tiomes then place it, again without looking or speaking on its own for a while ( naughty step!) where it cannot see you and then let it out when calm. If it repeats its behaviour then you must do the same. It is just like showing a child that this behaviour is unnacceptable and if it does not do as you wish there will be a consequence. Also, as you would with a child, be consistent. The first two weeks will be the testing time here, after that it should be a lot easier as the dog will have got the message. Our adult Dachshund is overweight.We have put him on a diet and he has lost the required weight in the required time. However, within an hour of his feeding time he is whining for more food and it is driving us crazy. He never did this as a puppy. He is fed 2 times a day, totaling a cup and a half per our vets request. he is given 2 treats a day only when he stops whining for 15 minutes. BUT, his whining way too much. Husband is threatening to give him away. Help please. Ringworm in Dogs – It’s Not a Worm at All!